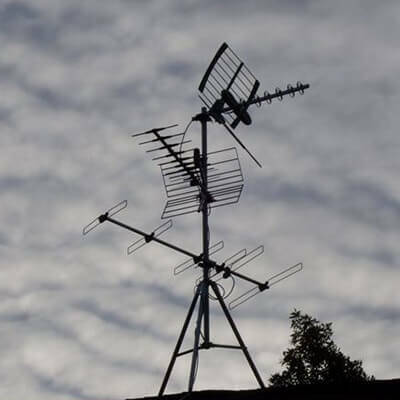 Digital HD TV Antennas: All people in Australia should by now be able to watch free-to-air television terrestrially or via satellite but for this they need quality receiving equipment. TV broadcasters provide this service, with support from the Australian Government. TV Antennas are the main reason for poor reception and could be due to the TV antenna installation being rushed or improper. A TV antenna needs to be properly maintained, repaired if broken and installed correctly to have the best reception. TV aerials need to be maintained too for good reception. You will not have much reception problems so long your equipment is correct and properly installed TV antenna. Where you live—this determines signal coverage and frequencies. What equipment you have—the simpler, the better! You need a good single antenna, a good cable and a fly lead. How it’s installed—your antenna should be outdoors, pointing towards the right TV tower. How it’s maintained—make sure your antenna isn’t rusty or broken, and has no missing elements. TV signal coverage reception depends on where you live. Some areas are on the outskirts of coverage areas, so if you live in one of these places it’s even more important to have your antenna system fully functioning. If you live outside the terrestrial television coverage, you can still receive a full set of digital channels via satellite (check out our information on the VAST service). Following the recent switchover and retune, digital TV services have been sectioned into frequency blocks. These are location-specific frequencies, so where you live also affects which frequencies you receive. A single antenna, appropriate for your local frequencies, should give you adequate reception of all services. For the best reception, make sure that your antenna points towards the broadcasting site that provides the best coverage for your location. Your television receiver should also be tuned to the services your antenna is directed at. Check out the mySwitch website for information on the best available television signals for your location, including signal level, frequencies and the best transmission tower at which to point your antenna. Generally, a simple antenna system consists of an outdoor antenna, a TV antenna cable, and a fly-lead between the wall plate and TV. 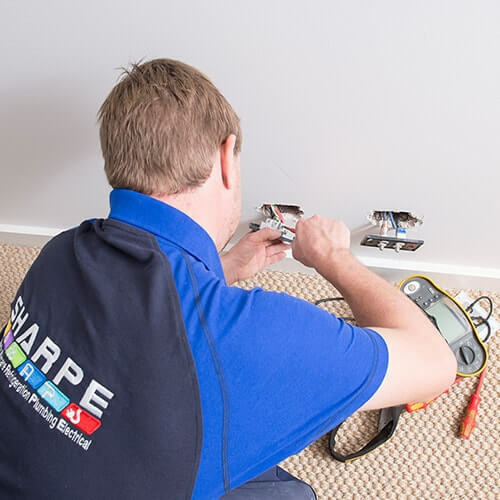 For the technical details speak to one of our expert TV antenna installer at Sharpe Group for advice. Are there any reception problems in the area? What signal coverage (strength) is available? Will a masthead or distribution amplifier (signal booster) be necessary? Which specific frequencies the antenna is designed to receive. The gain of the antenna—in areas of poor reception, it may be necessary to increase the received power of the broadcast signal with a more directional, higher gain and frequency band-specific antenna. 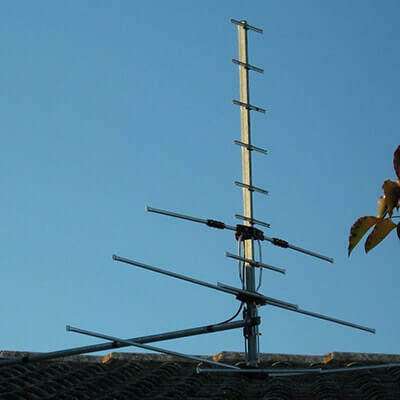 Digital terrestrial television signals in Australia are broadcast in VHF Band III (VHF channels 6–12) and UHF Band IV and V (UHF channels 28–51). Remember that television frequencies are location-specific, so check out the mySwitch website for tailored information before buying an antenna as it needs to receive the necessary TV frequencies. Provides enough signal gain for your specific frequencies so your TV receiver will get a strong enough signal level without requiring additional signal amplification (a signal booster). Shows good directivity and front-to-back ratio so it minimises reception of unwanted signals. Is robust enough to withstand harsh weather conditions or the continual attention of large Australian birds. A number of antennas either manufactured and/or designed in Australia meet these criteria, but antennas designed for other markets or for global distribution may not, so do your research or ask the experts. Indoor antennas (sometimes called ‘rabbit ears’)—in areas of high signal strength, an indoor antenna may just be sufficient to receive some or all TV channels. However, it may make your signal more susceptible to interference. Antennas designed to receive either FM radio or TV channels in the VHF band 1 and 2 (channel 0–5). Multiple antennas, combined and used to receive signals from a few broadcasting sites, will make your receive system prone to interference and reception difficulties. Talk to your antenna installer about removing any legacy antenna that is no longer needed. For good TV reception, you should use so-called ‘quad-shield coaxial cable’ (type RG6) with ‘F’ type connectors. Quad-shield cable provides better shielding against noise and external interference than single- or dual-shield cables. Fly leads, which are used to connect wall outlet plates to either the set-top box or TV, are generally the weakest link in the antenna installation. Quad-shield fly leads provide superior performance compared to other types. You should take care to maintain adequate clearance (at least 50 mm) from AC mains power cabling and leads to minimise induction of impulse noise. Excessive bending and long fly leads can also cause problems for TV reception. It’s best to use custom-made fly leads rather than connecting two or more leads. Masthead amplifiers (MHA) or distribution amplifiers—often called ‘signal boosters’—are not an integral part of what we call ‘optimised television receiving installation’. They should be installed only if necessary. These kinds of devices can cause reception difficulties and even interfere with your neighbors’ TV reception, so do your research before using them. An MHA—or ‘booster’—should only be used in areas where television signals are very weak because of intervening terrain, vegetation and buildings, or due to the distance between the broadcast transmitter and television antenna. An MHA is typically installed next to your TV antenna. A distribution amplifier is used to distribute the signal to several television receivers. Unlike an MHA, a distribution amplifier is installed within the building in which it operates, normally within the roof area. Distribution amplifiers can be used in houses with multiple TV sets, hotels, motels, blocks of units and similar high-occupancy buildings. If your local expert determines that a masthead or distribution amplifier is necessary to provide enough signal level to your television receivers, we strongly advise that you ask her or him to install an amplifier with a built-in filter or to install a filter in front of the amplifier. This will limit the potential impact of mobile broadband signals on your television reception. Call Sharpe Group for full information on 131 750. Climbing on the roof is extremely dangerous, so contact you local experts at Sharpe Group to make sure your antenna is safely and professionally installed. Your antenna should be installed outdoors, up to five metres high for urban and suburban areas and up to 10 metres high for some rural areas or areas with marginal coverage, pointing towards the TV tower that provides the best television coverage for your area. Check out the mySwitch website to find the direction of the best transmission tower for your location. Different areas on your roof may display different signal levels. Your antenna installer should be able to do a site survey and find the best location for your antenna on your roof, free of disturbance by trees or other buildings and other local signal obstacles. An existing Antenna location is not always the best place to replace it. It is possible that some environment has changed over time with the presence of disturbances. 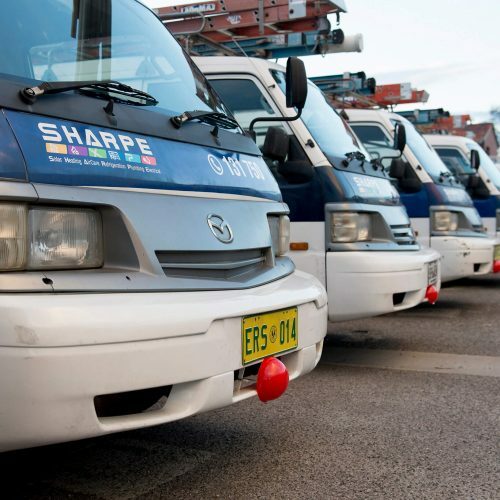 Sharpe Group electricians may have to identify a new site for optimum signals. Television signals are transmitted either horizontally (H) or vertically (V). This is called ‘signal polarisation’. 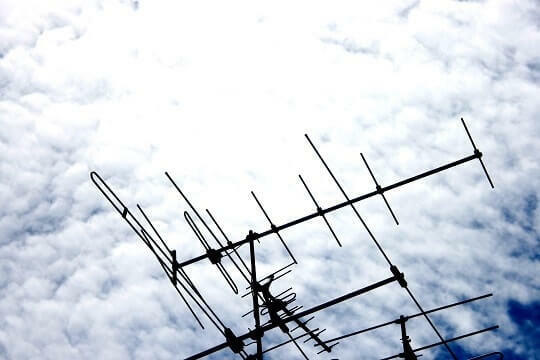 Your antenna should be installed so that its elements match the signal polarisation—that is, antenna elements should be installed horizontally to receive horizontally polarised TV signals and vice versa. Signal polarisation is also location-specific, so check out the mySwitch website for information on signal polarisation before installing your antenna. 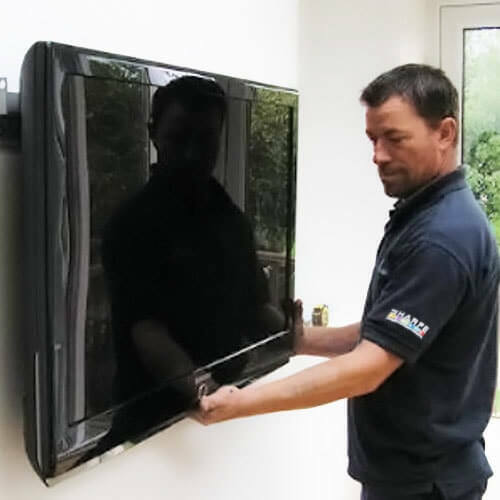 See below for some common installation problems that can lead to poor TV reception. Antennas perform better when they’re properly looked after. You will be delighted to know that a properly installed TV antenna often does not need much attention. Do an occasional quick visual inspection of your antenna from the ground. Check that your antenna is still there, it’s positioned in the right direction, it’s firmly attached to the mount (a lot of physical movement can affect reception) and it hasn’t lost any elements. Do a visual inspection of the connectors and fly lead next to your television receiver—make sure they’re not damaged or squashed by any furniture. Make sure all your devices are connected properly to your antenna, especially if you are using multiple devices connected to each other (such as TV, set-top box and personal video recorders). Double-check that all these devices are tuned to the right channels. Contact Sharpe Group on 131 750 for expert advice on TV antennas and book an upgrade or installation with us today with our online service request form. 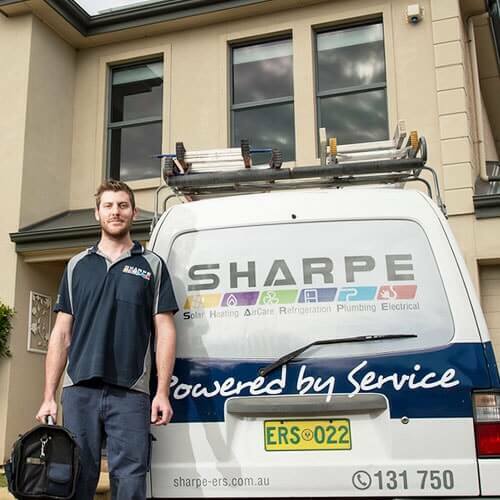 Sharpe TV and Data Electricians cover a wide variety of services like Digital TV Reception, TV Antennas, MATV Installation, Foxtel for Multiple Rooms, NBN Cabling, Signal Amplifiers, TV Tuning, Home Theatre Setup, VAST and many more.We have been doing just that for over 40 years.